Every Tuesday, a new addition is made to the Batavia Coffee blog. In the blog, we write about the road we travelled so far. It all started with an idea that occurred on a bleak day in India. This week: Selling Cold drip coffee at an ice cold Christmas market. After we had been selling our coffee at a pop-up store located in Utrecht we started to get the hang of it. We got a lot of feedback from the people who consumed our coffees, which was great. It was good to see how big the differences were between the six coffees we offered them. 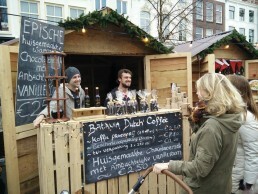 To prove that Cold coffee can be consumed everywhere, we decided to participate in the Christmas market in our hometown Leiden. Selling Cold drip coffee at a Christmas market might not be the best idea whit temperatures around the freezing point, but we had good faith. Fortunately, we decided to set up our wooden chalet with the necessary, yet probably flammable, Christmas lights from a cheap mass production store. Honestly, the first days were pretty tough. It was extremely cold outside and although it was not a problem for people to buy our Dutch Coffee it seemed a reasonable step to go out and visit the market. Fortunately, after a day or two, it became a bit drier and soon we wondered if we had enough bottles of coffee in stock. In advance, we decided to start the evening of day three by producing more coffee. On day four it became clear that our planning was off. Instead of just having to sell the coffee at the Christmas market, we now also had to produce coffee twice a day! After we finished working at the Christmas market, we had to produce coffee until late at night just to make sure there was enough coffee for the next day. Waking up early the next morning, we had to paste the labels with sleepy eyes, just before going to the Christmas market again. It was like a marathon. But one thing was clear: Dutch people also like ice coffee during winter! 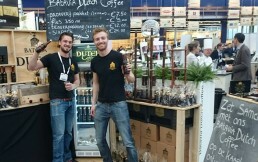 Every Tuesday we take you with us, in the world of Batavia Dutch Coffee. Previous week you could read how our adventure started. Today, we will discuss all the obstacles we ran into when trying to bring cold drip coffee – which is what Dutch coffee is usually called outside of Asia – to the Netherlands. After the idea started to enter our minds in India, we couldn’t wait to start working on it once we returned to the Netherlands. During the testing phase, we realized at least one thing: not being able to read Korean or Chinese was highly distressing. So, we had to trust our taste buds and test a lot of different coffees! After receiving all the instruments needed to start making the coffee, the testing phase began for real. Putting it nicely, not all coffees we developed were amazing, but we quickly realized that we were only drinking Cold Drip Coffee. This made us feel confident to work even harder. Once we truly entered the world of specialty coffees we came to the conclusion that there was so much more to offer. 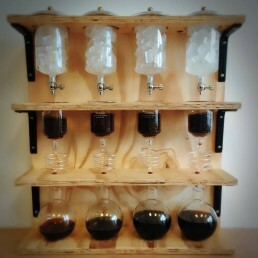 The first cold drip coffees we produced were made solely with wooden instruments and had an expiration date of about three weeks. The expression “hit the ground running” nicely describes our strategy at that point. While we had just enough capacity to produce a couple of bottles we tried selling the coffee right away. Right after we found our first customers, we decided to build a prototype for a bigger production. The resulted in a monster production of about 20 liters of coffee per batch. A few weeks later we realized even this would not be enough. Nowadays we drink about this much coffee at the office a week. It is now almost three years ago that Jits and I started our adventure together, trying to bring Dutch Coffee back to the Netherlands. Ever since 2014 we experienced some great things together, but starting a blog kind of slip our mind during all the exiting things we had planned. So, from now on we would like to include you in our adventure, telling you all about our journey and experiences making Batavia Coffee. If you want to be notified when a new blog is placed, then follow us on Facebook. All new blogposts will be added there. In this fist blog, we will discuss how it all started. Taking you all the way back to the summer of 2013. During his study in South-Korea, Jits discovered ‘Dutch Coffee’ at an airport. The black ice coffee, served in large glasses looked didn’t look Dutch at all, yet the salesman was convinced that it was a typical Dutch drink! Arriving at the city of Seoul, Jits discovered that the small coffee place at the airport wasn’t the only spot in Asia where black ice coffee was sold, represented as typically Dutch. Eventually, Jits got curious and went to try the drink himself. As a fan of black warm coffee, he found that the black ice coffee was perfect for his taste. The owner of one of the coffee places Jits visited, told him that the coffee was named after the original brewing method founded by Dutch merchants in the 17th century. 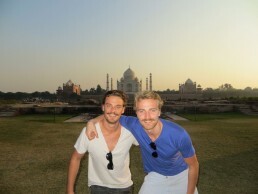 After finishing his study in Seoul, Jits travelled to India where he met up with me. Together we started working for an IT-company there. In no-time the idea developed to start our own company together. As huge coffee lovers, it wasn’t always easy to get a decent morning coffee in India. During work, our colleagues usually drank thee and the streets were dominated with street carts selling Chai. They did sell ice coffee in bars and restaurants but it was usually made by using a bag of instant coffee decorated with vanilla ice cream on top. It was at an incredibly warm day that Jits told me about his coffee experiences in South-Korea. At that moment we decided that, after nearly three centuries, Dutch Coffee deserved a comeback in the Netherlands. We started preparing during our stay in India so that we could launch Dutch Coffee right after arriving back in the Netherlands. 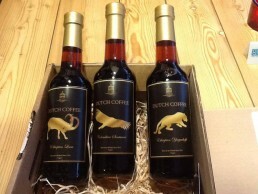 We reserved www.dutch-coffee.nl and contacted every supplier of Dutch coffee we could find. Eventually, we found a match with a company called Tiamo. They make both classic Japanese coffee as modern Dutch Coffees. After months of e-mailing the company back and forth with the company we ordered our first shipment which was ready for us upon our arrival in the Netherlands.